Clusters of insignificant, green flowers appear in May and June among small, lustrous green leaves with yellow margins, which often take on a reddish bronze flush in colder winter. 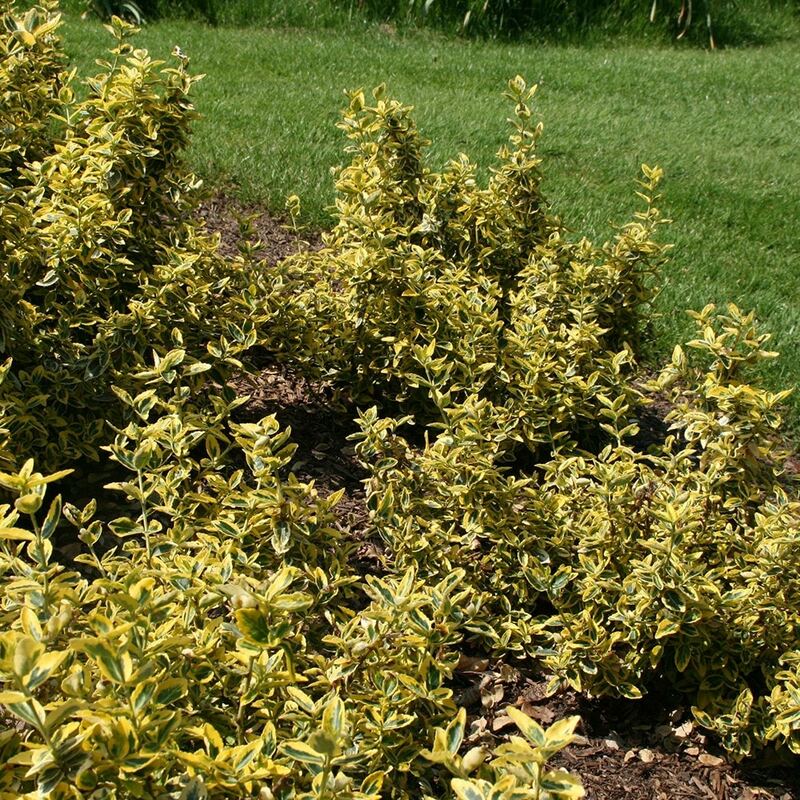 This popular, bushy, variegated, evergreen shrub makes excellent groundcover and is a mainstay of low-maintenance gardens, but it also makes a good foil for more ornamental, golden-leaved shrubs. It is tough and will thrive in any well-drained border in sun or partial shade. I've bought this before and like the fact that it's variegated and evergreen. Even after many years of gardening I sometimes find it difficult to visualize some pot, and therefore plant, sizes that are not in regular use. I find this reminder most helpful. Hi. I'm looking to plant a series of dwarf evergreen shrubs along the edge of a bed to act as a visual boundary for my dogs. I'm thinking of using Euonymus fortunei 'Emerald 'n' Gold' but really want to restrict the height to about 40cm. I see in the notes that 'young' plants can be pruned in early spring and my question would be, can this pruning be carried out each year to maintain the desired height and, if so, would this have an impact its spread? Suggestions for any alternative evergreen shrubs would be appreciated. Cheers. Can I plant Euonymus Fortunei emerald & gold (1.5 litre pots) in early November? Can this plant cause a skin irritation? Hello there It is not one of the plants that is know to cause skin irritation. Hope this helps. What could be the cause and how to get rid of 'white powdery substance covering many leaves of my Euonymus fortunei 'Emerald'n'Gold which is planted in a ceramic pot. This is the second year I have had this plant, it was not like this last year. Its position is part sun/part shade and does not get rainfall only watered by myself. Thank you. Hello, This could be powdery mildew, which is brought on by the plant being too dry, often also with poor air circulation around the top growth. Therefore I would try to water more often, pot it up if necessary, and if it is really bad, spray with a general purpose fungicide.